Irish Soda Bread Recipe | Exploring Food & Drink in D.C. In a large bowl sift together flour, sugar, baking soda, baking powder, and salt. Combine to the flour mixture with softened butter, egg, and buttermilk substitute. This can be done by hand or by using a dough hook. Once fully combined, turn dough out into a lightly floured work surface and kneed slightly. I find that my large bamboo cutting board works really well. Create a ball shape with the dough and place on a baking sheet. Using a knife, cut an X shape into the top of the dough. It doesn’t need to be more than a quarter inch deep. Combine the final ¼ cup of buttermilk substitute with the melted ¼ cup of butter and brush all over the outside of the dough. Bake for 50-60 minutes. (55 minutes would probably have been perfect, but 60 didn’t burn the bread, and it was still soft.) Bread is done when a toothpick inserted into the middle comes out clean. 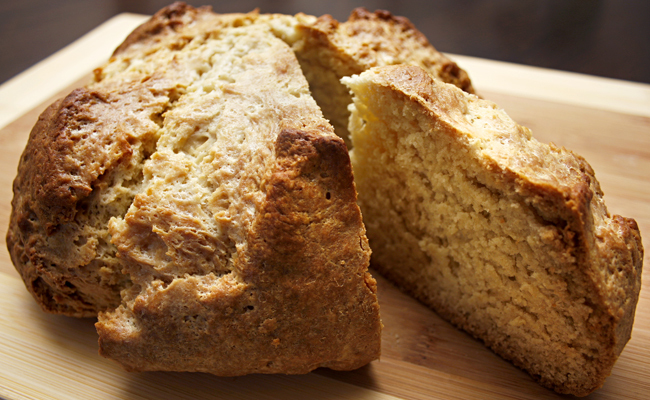 Tags: Irish Soda Bread, recipe, St. Patrick's Day. Bookmark the permalink. I am thinking this is the same or similar recipe my Grandma used to use and it is a good one. I want to try and replicate it.